Helicopters carry out the most demanding missions in some of the most extreme operating environments; we understand this, and design our products as well as support systems to anticipate customer needs, enhance aircrew safety, and provide operational cost benefits. Our systems become a force multiplier for military and commercial operators alike. Advanced rescue hoists and cargo winches help save lives during disaster relief efforts and rescue missions around the world. 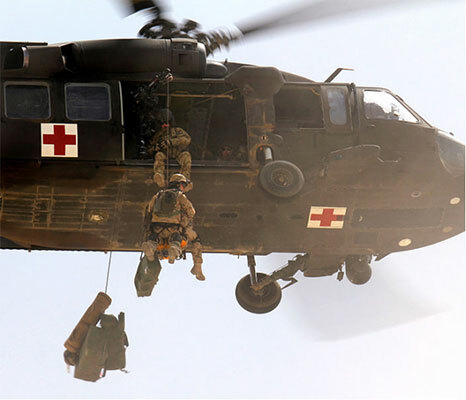 Field-proven hoist and winch technologies from SIS are used by U.S. and foreign militaries and coast guards as well as police forces, firefighters, medical evacuation crews, and private operators around the world. As the only producer of both traditional level wind and more advanced translating drum cable management systems, SIS offers a variety of solutions for operations in high-demand, unpredictable or extreme environment conditions. The business also innovates in dual-hoist systems, increasing readiness for search-and-rescue teams. Pegasus® is the next generation of rescue hoist, advancing our traditions of mission reliability and innovative technology through its transformative design. Durable components, modular architecture and new features — such as the DASH™ (Data Acquisition Sensing and Health) system — mean the Pegasus® is ready to help ensure your missions are completed faster, safer and more efficiently.